« So You Think You Can Fix the Corporate Tax System? 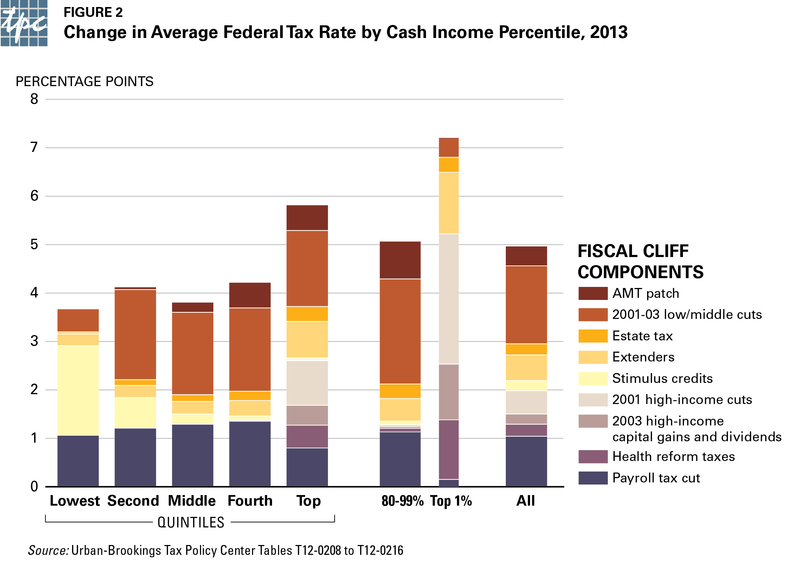 Roberton William, Eric Toder, Hang Nguyen, and I are out with Toppling Off the Fiscal Cliff: Whose Taxes Rise and How Much?, a detailed look at all the tax increases in the looming fiscal cliff. We have two basic messages. First, the cliff is big, amounting to more than $500 billion in 2013, a 20+ percent increase. Second, you can’t tell the players without a scorecard. Over the past dozen years, the snowball of temporary tax cuts (and, for 2013, the introduction of some new taxes) has grown to epic proportions. As a result, the cliff isn’t just about the 2001-03 tax cuts that grab most of the headlines. There are also the temporary cut in payroll taxes, the “extenders”, the expanded credits enacted in 2009, the current version of the estate tax, the AMT patch, and the start of new health reform taxes. Bottom line: People of all incomes will see their tax go up if we go completely over the fiscal cliff. But there are significant differences in which provisions matter most. The fiscal cliff threatens an unprecedented tax increase at year end. Taxes would rise by more than $500 billion in 2013—an average of almost $3,500 per household—as almost every tax cut enacted since 2001 would expire. Middle-income households would see an average increase of almost $2,000. Policymakers are rightly concerned about the potential impact on families and the economy of such a sudden tax increase and are considering proposals to delay, repeal, or offset parts of the cliff. To inform that discussion, this report provides a detailed look at the revenue, distributional, and incentive effects of these increases. Almost 90 percent of Americans would see their taxes rise if we topple off the cliff. For most households, the two biggest increases would be the expiration of the temporary cut in Social Security taxes and the expiration of the 2001/2003 tax cuts. Households with low incomes would be particularly affected by the expiration of tax credits expanded or created by the 2009 stimulus. And households with high incomes would be hit hard by the expiration of the 2001/2003 tax cuts that apply at upper income levels and the start of the new health reform taxes. Taken together, the scheduled changes would significantly increase the marginal tax rates that can influence behavior. Average marginal tax rates would increase by 5 percentage points on labor income, by 7 points on capital gains, and by more than 20 points on dividends. I’d like to know the impact on a very high-income taxpayer who happened to be paying about 14 percent income tax. En Mars de l’année suivante Givenchy a annoncé que tricots Gallois assistant Julien Macdonald prendrait les rênes une fois le contrat de McQueen a pris fin en Octobre 2001.